First, what is Möbius? Möbius is a surface with only one side and only one boundary. A good example of this is M.C. Escher’s “Ants on a Möbius Strip” seen below. How does this relate to Experience Event Design? The concept must be an endless and continuous movement. Having had the pleasure to aid in many event planning sessions over the course of my lifetime which many were repeating, I realized early on that most plans only focus on a moment in time combined with a single characterized theming principle. Most events lacked any real purpose other than to host of notoriety, make money or to celebrate an occasion. But what if the event could be much more and possibly without any more effort or possibly even less? There had to be some method that increased the impact and experience of any given event. An event had to be planned far beyond the constraints of the event moment itself. It had to flow with consistency, purpose, theme and direction. It was more than a single event disconnected from any other. It could be like a Möbius strip, seemingly without beginning or end. Before I explain any further, let me share that this post will cover four key issues around an experience event; Theatre, Experiences, Stages of Experience, and Ownership. Every event you create, host or involved with is a production of theatre. You have your performers and your audience. You follow a script and each person has their role. Never treat it any less if you strive to make it a great experience, anything less is merely a service valued on price. To be in the mindset of theatre one must focus on the Why and How and not the What. Service mindsets focuses solely on what work is performed; an experience mindset focuses on how the what is performed. Before you can even think of focusing on how the whats will be performed you must understand why you even doing it and for who, because the event is never for the performers, rather for the audience. So take the advice of Simon Sineck and “Start with Why”, then focus on the Who before you focus on the How and What. When it comes to event experiences its important the theme or motif of the event should not be the focus of the planner, rather how the theme is expressed through the event experience. Experiences exist in four realms and are anchored across two axises by the level of involvement being passive or active and the axis of engagement from absorption to immersion. These axises create four experience realms of Entertainment (passive/absorb), Educational (active/absorb), Escapist (active/immerse) and Esthetic (passive/immerse). Knowing which of the four your event should be structure upon is important. More important is developing with all four in mind creating a sweet spot of all four realms. Is not to say that over the span of the event experience the type of experience can shift more in favor of one or more realms. A tool for this is to divide the span of the event into five distinct stages and use the experience grid with percentage of a 100 points per stage. This will help focus on the type of content and performances needed to stage the experience. With all curated experiences, there are identifiable stages along the course of the experience. Typically there are five unique stages; Attracting, Entering, During, Exiting and Extending. My view, at each stage a planner should use the theme grid percentage tool to keep the overall flow on track to stage the complete experience theme. Attracting happens before your audience ever arrives to the event or walks on to the premises hosting the event. Attracting is the time when you are creating interest in the vent. Invitations to a wedding, advertising for shows or even things shared on social media of previous experiences. Guaranteed, you may not be able to control social media and I never believe anyone can, yet you can add content based upon the four realms of experience to this stream to help in attracting and beginning telling the story of the event experience. It is the stage where expectations are established. The Entering stage is the transitional stage or liminal zone to the event experience. At this stage, the audience is moving from the outside world into the space hosting the event. Cues need to support the expectations created during the attracting stage. Which of the realms of experience should be the focus during this transition? Which support and enhance the transition best? A simple example of using the Esthetic Experience (passive/immerse) in the Entering stage could be as your audience or attendees arrive the registration/ticket area is staged as an extension of the overall event. If the event is focused on music, than maybe the space is walled with blank oversized music sheets used as messaging boards, agendas or event highlights. Maybe there are sitting areas with instruments so visitors can huddle and play music while waiting. During is the event itself. It is the action and performances occurring as the main activities. This stage of the experience holds the most weight of the experience. When using the Experience Realm focus on staging on the sweet spot of the grid, the center where all four realms come into play. That is to say, you can not focus on one or more types of experiences at various times or overall, just be aware that “During” is the stage to create the greatest impression and experience of the event. Exiting is another transitional or liminal zone. The stage is useful in building memories of the event experience. the audience is transitioning from the experience(s) you have created back into the everyday world. You do not want them to transition abruptly or without reinforcing their experience. Look to the four realms once more, what type of exiting experience will enhance their overall experience as well as create a positive memory as the exit? Could the exiting space be gift bags arranged on a display that highlights the events activities or some area for reflection before departing? Whatever it maybe, it needs to be less that main experience, but still extend from the experiences already engaged in. Okay, everyone is gone, the space is cleared of the previous event it’s over right? No! Extending the experience is the critical piece of the memory around the experience. Having something to extend beyond the experience to help remind your audience of their time spent, since time spent with you or your experience is what is at stake. Take a ballpark ticket stub. This is a natural extending element of the experience. Each time you see that ticket it brings up the memory of the experience. It is a piece of memorabilia or token of your time spent. Crete a unique piece of memorabilia that your audience can take with them or receive later to remind them of their time with you or your event. So I shared a lot on experiences, staging of experience, stages of experiences and even the realms of types of experiences, but the real challenge to planning is knowing who owns these experiences? Do you the stager/planner, the performers who interacted with the audience or the audience members who the event was created for? In reality everyone involved, because experiences are unique to each person and are held internally. Each person experiences differently. All a planner can do is plan with a purpose, stage with direction and reinforce with strong performers, a good script and the right props. So why is it called the Möbius Method? Because all experiences flow into the next and each staged experience moves from internally curated by the planner,stager to externally experienced by those in the audience or getting involved. 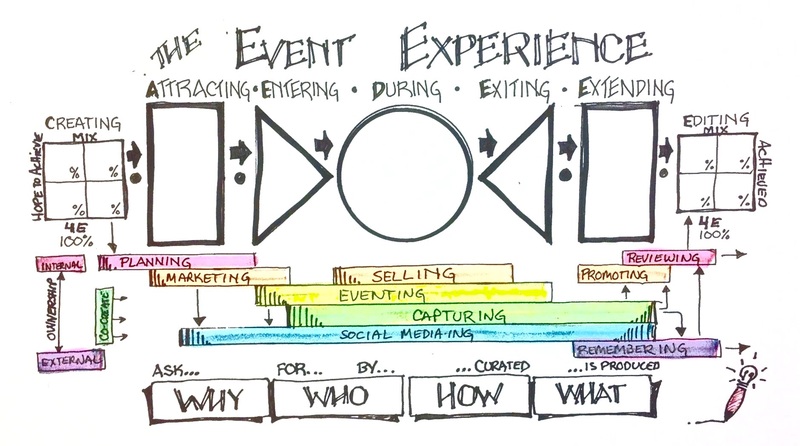 Like the Möbius strip which rotates and twist so it becomes endless and transitions from being internally to externally facing and back again, so to is the role of the event experience planner. Before you close out this post, take a moment to reflect, not on the events you stage, rather on how you stage your interaction with clients. These too are events and follow the same rules of theatre that your offering does. How are you leading your clients through the stages of experiences and which types of experiences are you using at the various stages. Interacting with each client and moving from one client to the next is your Möbius Strip of Business, stage it well because you are creating memories on the time your clients spend with you. Here is a Visual Strategy tool to help when planning. Well done Kevin,… it captures the essence of ‘design’ for the Event Experience.